While the 11th November 1918 was an end to the fighting for Great Britain and became the focal point for remembrance in the post-war world, it marked a day of defeat for Germany. It always seems fitting at this time of year that we should recall Germany’s losses as well as our own; the many Great War veterans I interviewed had much respect for ‘Fritz’ and knew that as front line soldiers, they all shared the same privations and conditions. 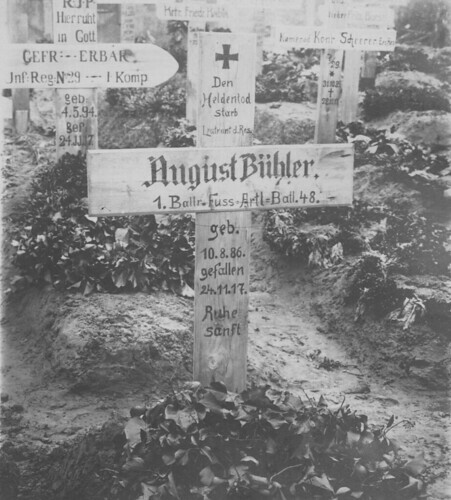 By the end of the conflict Germany had suffered in excess of two million battlefield related deaths and this image from a German artilleryman’s scrap book gives us just one small insight into those huge losses, showing German graves on the Western Front in late 1917. This entry was posted on 09/11/2012 by sommecourt. It was filed under German Army, Germany, Great War, Remembrance, War Cemetery, Western Front, WW1 and was tagged with German Army, Germany, Remembrance, War Cemetery, War Dead, WW1.